This week, in our final episode of the spring 2012 semester, we focus on the word "Loss". We discuss how losing a round of chess can actually help you get better at the game. Then we discuss the effects of memory loss. You win, when you lose. It is a battle that's gone on for centuries now. Chess. It is based on the concept of war, and players win by using strategy, rather than strength. Assignment: Radio reporter Lauren Abram sits down with Aaron and Shawn, two ordinary college students their only day off from work. They are both wearing swim trunks, and look like they're preparing to venture outdoors.Instead, they're entertaining themselves with a square 8 by 8 wooden board and each of their 16 pieces lined up in perfect battle formation.Since becoming roommates, Aaron and Shawn make it a weekly habit to sit down and let off the stress of the day with the spoils of war. They have been playing since they were children, and the fact that there is a certain amount of predictability in each game only adds to the complexity. Aaron says that the first two or three moves on either side of the game determine the rest of the game. He explains that there are usually only three opening moves that white side would use, and what black does to those couple of moves is what defines the game as either open, closed, or semi-open. “In an open game, there's going to be a lot more action. There's a lot more pieces that can move freely on the board. There are a lot more attacks that could happen." Just setting up a game of Chess could be considered complex, but the rules remain simple: Each piece (a rook, a pawn, a knight, a bishop, and the king and the queen) can only move in a certain way. From there, it's all tactics, says to Shawn. “I've never really played somebody that I felt was so extremely good at chess that I thought I was going to lose right away. The only person I played was Aaron's friend Bobby; he'd been playing a long time and was really good because he was in chess club. I've never been in a chess club so I didn't know what to think. We both just played it by ear and I actually ended up winning that game. A situation like that with a novice player triumphing over an advanced one doesn't happen too often. According to Aaron, chess is not a gambler's game. Luck and simply knowing how to play are only the starting points. "There's a difference in knowing how the pieces move and how to win the game. If you know how to end a game and you're playing against someone who doesn't, you can be down a lot and still end up winning or you can just trick them into stalemate. That's a lot of people's goal once they figure out they're going to lose is to try to just force a stalemate. 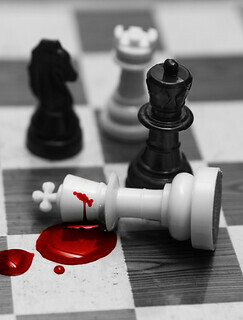 It’s better to force a stalemate than lose the game." The game of chess is fueled by individual strategy and skill, making a loss particularly personal. However, many players are able to look past the disappointment and see the good in defeat. Aaron suggests it’s not only polite to be a gracious loser, it is actually the only way to improve your skill. To a certain extent, memory loss is normal. We all experience it. We might forget where we parked, or the name of a co-worker, and never think about it as a serious issue. Sometimes, minor memory problems can signify the onset of a more serious condition. Assignment: Radio host Meredith Everitt investigates the nature of memory, and diseases that affect it. Dr. Elliot Ross, Professor of Neurology at the OU Medical Center in Oklahoma City studies how the brain works, and why it sometimes doesn’t. He explained that when we are in the process of remembering something, we are drawing from many different areas of the brain. Even when using our complete arsenal of mental tools, life can be a challenge. When minor memory problems develop into serious ones, the effects can be disruptive and even life-threatening. Currently, Alzheimer’s disease is the sixth-leading cause of death in the United States, with 5.4 million diagnosed. That number is climbing as the nation’s median age rises. Dr. Marilee Monnot, Neurology professor at the OU Health and Sciences Center in Oklahoma City, described how this disease affects patients. According to Dr. Monnot, if uncomplicated by stroke or other brain damage, Alzheimer should not impede patients’ ability to retrieve older memories, like autobiographical information. She warns that patients who already have diabetes are more likely to have strokes, which is even more dangerous when paired with Alzheimer’s. While advances in technology bring us closer to understanding and possibly defeating diseases like Alzheimer’s it can be difficult to predict when the next breakthrough will come. According to Dr. Monnot, there have been several setbacks. In addition to medication, scientists are exploring other possible therapies that have shown promise in recent years. One non-profit organization called “Music and Memory” uses donated iPods to stimulate the brains of patients with dementia. Click here, if you would like to donate money or an mp3 player to Music and Memory. The documentary “Alive Inside”, released last month, witnesses the remarkable change patients undergo with this organization’s help. In one scene, a man mumbles incoherently, and doesn’t recognize his own daughter. As a nurse places earphones on his head, his face lights up. He begins singing along, waving his hands in the air. When the music stops, the effect does not. For a while, he can speak in complete sentences, and even answer yes or no questions. According to the Alzheimer’s Association, there is no cure or way to prevent this disease. Hopefully, that will change soon. In the meantime, scientists and doctors will continue working to improve the lives of those affected. And moments of clarity, like those provided through music therapy, can briefly reconnect us to those who weren’t reached in time.